The Academy Plaza Hotel is one of the most ideally located in Dublin city centre, it is just a short stroll to Temple Bar, shopping and business district, Croke park stadium, Trinity College, St Stephen’s Green and many other famous landmarks, city sights and attractions. This three star hotel has a modern luxurious feel to it from the minute you step through the doors into the magnificent marbled lobby. 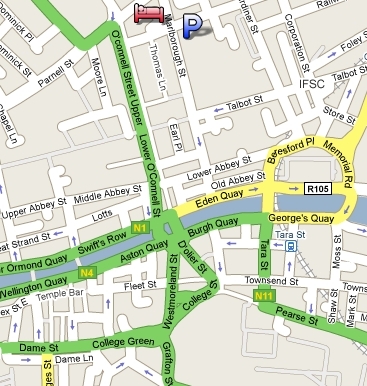 Location: Academy Plaza Hotel is situated at 10-14 Findlater Place, just off O'Connell Street, in the heart of Dublin city. Discounted Parking near by at Q-park. Restaurants: Offering two restaurantes to choose from; At the Plaza bar, a selection of best Irish whiskeys and beer await for you. If you desire informal dining in a relaxed atmosphere our chefs prepare a selection of mouth-watering grill dishes with Traditional Irish fayre. We also have a weekly cocktail special just for you, ask our friendly staff what is it this week and enjoy. Oscars: Get fed for the day ahead with a full Irish breakfast in Oscar’s restaurant which is open daily. Oscar’s restaurant can also be specially laid out to cater for private dining for groups for up to 80 people. Our Chef’s menus combine traditional cuisine with an interesting modern flair.